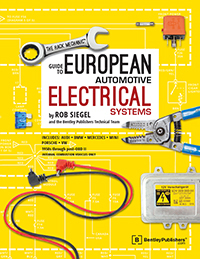 Roundel Magazine Review: The Hack Mechanic Guide to European Automotive Electrical Systems is your own electrical therapist. "Consider it a tool to help get over the fears and confusion regarding electrical circuits, sensors, relays, and switches. In fact, it's more than a tool; it's like having your own electrical therapist. As a test, I used the book to troubleshoot an odd lack of spark on an Austin-Healey last week. by Bentley Publishers, this one titled The Hack Mechanic Guide to European Automotive Electrical Systems. 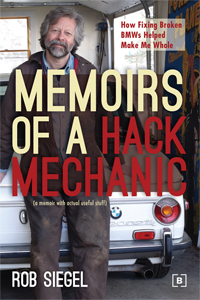 Siegel's writing is well known to Roundel readers, and since the publication of his first book, Memoirs of a Hack Mechanic, his colorful and heartfelt writing has connected with an enormous audience of "other" car fanatics, as well as those curiously connected with them. I was excited to be reading another one of his books, with the prospect of reviewing it in published form, until I realized that it was a book ... about. .. automotive electrical systems. Perhaps the driest subject matter imaginable, right? Even though I'm a professional mechanic, only math fills me with more dread than the prospect of diagnosing and repairing errant electrical malfunctions in a car. Most people are visual learners. Things like math and electricity are invisible, mysterious, haunting forces - invisible, that is, until it's too late. Ever seen an electrical circuit burn up in smoke because two wires decided to get a little too friendly? Some things are best left unseen - and unsmelled. But here is a book thoughtfully and exhaustively crafted to put our fears at rest, and explain the nature of the scary, complex things connected to all those wires. It's not as warm and fuzzy as Siegel's first book, but it digs immediately in to the nitty-gritty of why electrical things work - or don't work - on our cars, in a manner that still makes for thoroughly pleasurable reading. (I was so happily submerged in this book while on vacation at the beach that I received the worst sunburn of my life.) I only wish that this book had been presented to me about 25 years ago. In fact, I'd suggest it as textbook material for professional educational programs, and it is essential reading for the do-it-yourselfer. Siegel's book has all the elements: hilarious personal anecdotes, entertaining warnings, loads of photographs, and easy-to-understand diagrams - along with the sort of personal touch rarely found in technical guides. Often, I'll open a technical manual in search of the simple answer to a simple question, and invariably stumble upon some word or term that I've never understood. This is usually the point at which my monkey brain takes over and I lose my train of thought, ambition, and patience to solve what began as a simple repair or troubleshooting project. But this book kept me on track the entire way through. Among my favorite things, was a clear, easy-to-navigate index and table of contents. I find myself constantly flipping through the pages of most technical reference books, going from glossary to index to maingroup sections to table of contents, and back. This book makes that process a cinch. provided everything I needed to know to methodically trace and resolve the issue. That sunburn doesn't feel so painful anymore. I'm often asked for advice by people interested in working on their cars for the first time. I almost always respond the same way: "Get a Bentley book for it-then go from there." This particular book isn't just for novices; it has the good nuts-'n'-bolts stuff to refresh the skills of even veteran technicians and mechanics, while still making the world of automotive electrical service accessible and welcoming to the beginner. Whether you're working on a 1970s coupe or something still functioning on its second 14,000- mile oil change from 2013, this book will assist you in understanding, diagnosing, and repairing the many simple and notso- simple electrical circuits designed to make your car function properly. And Rob, my darling, just so you know: This isn't another automotive book that will sit on my book case at home. This one's going in my tool box at the shop. Permanently. Besides, it's already got greasy fingerprints on it.